2 1/8"L x 11/16" square. Mirror is darkened around edges. Silver has not been polished. Good working spring action hinge. Opens and closes well. No dents, dings, nor scratches. Designed for 12mm. Mirror has few tiny blemishes. Marked inside: "Sterling" for. 925/1000 silver purity. Weight (with mirror): 1.77 troy oz. (54.9 gr.). Silver free of dings and dents. No maker/manufacturer and country of origin marks. Hard to find in new condition. Beautiful sterling silver & gold color. It has never been used just displayed. Marked on top of the tube as shown in photo. Really beautiful. I have 2 compacts listed also. 3.5" long x 1.25" deep. In good preowned condition, showing little use. 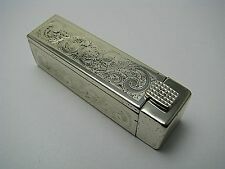 It features a engraved design. Weight(grams) 20.9 grams. Markings 800. Material. 800 Silver. That being said, mistakes can occur. Vintage Revlon Futurama Lipstick Case & Face Powder Puff Box Van Cleef & Arpels. There is no mark on the powder puff box case but it does look like it belongs with the lipstick case.Condition is Used with signs of wear. Please see pictures for more information and condition. Vintage Viv Vivid Ruby lipstick by Toni in original metal case. Vintage Toni lipstick in original metal case. The metal has noticeable scratching and tarnish throughout. The lipstick still twists up and down. I don't know how much lipstick remains nor how much the color has changed over the years. I believe this dates to the 1950's because of advertising from that period that features this item. The lipstick in the case measures approximately 2.25 inches high. This is an estate treasure so its history is unknown. If you have any questions or would like more pics please don't hesitate to message me. - - - - - Thank you. Deeply carved. 2-1/2” x 3/4” square. Total weight is 37.4 grams. See photo of maker’s and/or other marks. In Excellent Condition. Of heart and immune system, and promotes good health. VTG Silver 800. Green T ourmaline Gem Stone. Slide the mirror hinged door under the stone and it locks it in place. Floral and full design and hinged mirror. The piece of jewelry is in very good used condition unless otherwise stated above in the 'Condition' area. These are an estate sale find. They have never been used. The eel skin is super soft and supple. The colors are deep and vibrant. Based on the made in Korea lable, vs republic of Korea, the lable dates from the 1970s to early 1980s. Condition is Used. 3 1/2" tall and 3 3/4" across. Initials DP in bottom, shown in last picture. She has blonde hair designed in a "bob" hair-style. Blue eyes. Gold/white designed dangly look, and religious-inspired crosses throughout tube. No maker marker. Inside is empty/clean. She stands 4.5" tall. Red Gem Possibly Coral. Marked and tested as. 800 Silver. Vintage Van Cleef Arpels Revlon Lipstick Container Futuristic Silver Rhinestone. Condition is Used, but good shape for age. Two small rhinestones missing on side. Shipped with USPS First Class Package. NO MORE EXCEPTIONS. Many signed and unusual pieces. Our offices are smoke free, but can not account for previous owners! Otherwise, I reserve the right to re-list the item. · We try to take the best pictures we can. This has not been repainted as it adds much more character. Would make a great decorator piece on your dresser or countertop with all of your lipsticks displayed. Good condition.light wear. COLOR MAY VARY DUE TO MONITOR SETTINGS. Has embossed floral rim design. No maker marking were found. Super cute! Only fault I could find is on flower has pedal chipped (seen in last photo). Hard to see & not noticeable. Felt bottom is securely intact. In good condition, no cracks, but the base is bent, won't sit level. Appears as new and unused! Excellent Condition with no defects or flaws to note. Lovely hot pink! Beaded with no missing beads. Measures 3.5@ x 6.5” with mirror MK Signature Mary Kay Hot Pink Beaded Mirror Snap Lipstick Case Holder. Condition is Used. Shipped with USPS First Class Package. Vintage 60's Paper Mache Lady Head Bust Lipstick Holder 7"
Paper mache and plastic. She has one ding. It doesn't get any more retro than this! on one curl (see photo) otherwise is in great shape. 60's flower girl! THE BOTTOM IS DATED 1967 AND SAYS WHO IT WAS DECORATED BY AND WHO IT WAS FOR. STANDS APPROX. MADE IN FRANCE WITH PORCELAIN BY LIMOGES. Art Nouveau Motif w/ Floral Chasing & Ribbed Design. 950 Silver. Flower Slide. No Monograms. Tests Reveal 95% Composition. Unmarked as to Maker or Fineness.